One of my all time favorite experiences ever is visiting the Grand Canyon. Every time I see it my eyebrows go up, my jaw drops down and the sensation of divinity becomes clear and present. 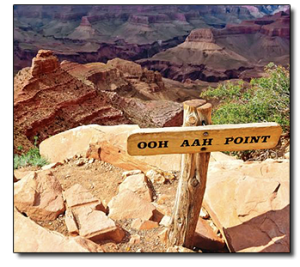 If you stand on the southern edge of the Grand Canyon you can clearly see the dangerous, rocky, risky, steep and treacherous hike it would take to get to the other side. An ominous trek indeed.